David Kaapu (middle with lei) was recently reappointed by the Hawaii State Senate as the Hawaiian Homes Commissioner for West Hawaii. The Hawaii State Senate recently voted to advise and consent the reappointment of David Kaapu to the Hawaiian Homes Commission. Commissioner Kaapu will continue to represent West Hawaii (Hawaii Island) and his term runs through June 2021. Mr. Kaapu is an attorney who specializes in quiet title; business law; wills, trusts, and general litigation; as well as land use. Mr. Kaapu has been a Commissioner of the Hawaiian Homes Commission for four years, where he utilized his legal knowledge to assist the Commission to make well-informed decisions on various matters. Mr. Kaapu has also served on a number of boards, such as the Hawaii State Bar Association, Friends of NELHA, Hawaii Community Federal Credit Union, and Agricultural Leadership Foundation of Hawaii. 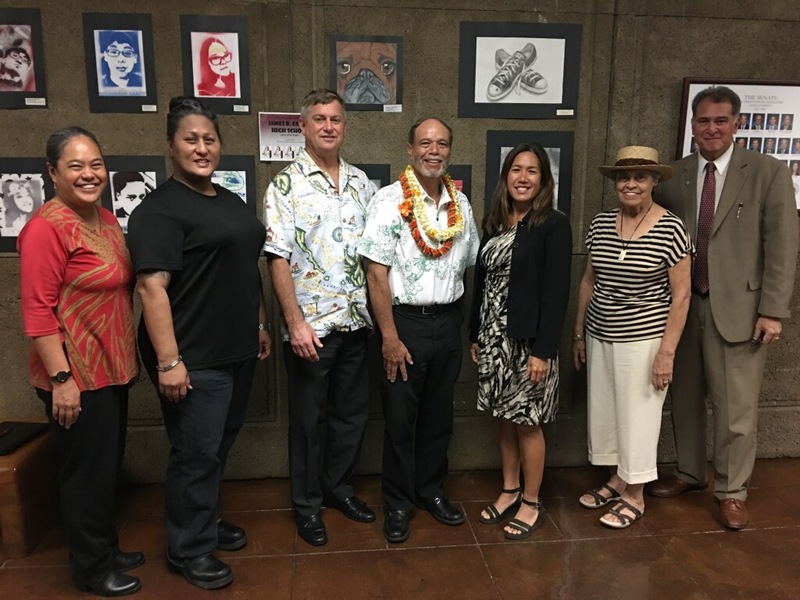 Commissioner Kaapu graduated from the University of Hawaii with a Bachelor’s in anthropology (Hawaiian archaeology) and received his Juris Doctorate from Santa Clara University in 1988. More information about the Hawaiian Homes Commission can be found by clicking here.